Mon, Apr 8, 2019, 11:37 pm SL Time, ColomboPage News Desk, Sri Lanka. Apr 08, Geneva: An interactive scholarly discussion on the significance of the Tripitaka as a world heritage took place at the World Intellectual Property Office (WIPO) headquarters in Geneva, continuing the week-long celebrations-'Tripitakabivandana'. 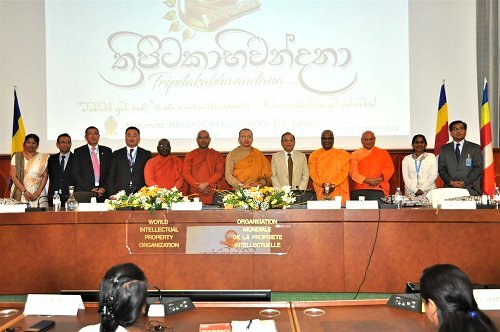 The event intended to raise awareness among States that follow the Buddhist traditions, as well as other States, to join hands with Sri Lanka in realizing the initiative taken by President Maithripala Sirisena, to inscribe the Tripitaka on the UNESCO 'Memory of the World' Register. A scholarly presentation on the topic "Why the Pali Tripitaka Should Be a World Heritage? : Sri Lanka's Contributions to the Buddha vacana" was delivered by Venerable Deegalle Mahinda Thera, Professor in Study of Religions, Philosophies and Ethics, College of Liberal Arts of the University of Bath Spa in the United Kingdom. The eminent scholar monk eloquently elaborated on a number of landmark events and key personalities involved in preserving this intrinsic body of Dhamma through centuries. Addressing the event, Sri Lanka's Permanent Representative to the UN in Geneva, Ambassador A.L.A. Azeez underscored the significance of the Tripitaka as the foremost compilation of Buddhist philosophy and as a repository of spiritual knowledge that is close to the hearts and minds of Sri Lankans as well as millions of people over the world. He made these remarks underlining the need for collaboration among all Member States in recognizing it as a world heritage. "For millennia, the Tripitaka has been a shared heritage of the Asian communities, and over the years, there is growing worldwide interest in the study of Buddhism, most notably in Europe, North America and Australia. This is because there is increasing recognition that Buddhism, in essence, is a way of life and a philosophy that could be easily related to and practiced by anyone anywhere," he stated. Ven. Walpola Kalyanatissa Thera, Spiritual Advisor to the Geneva Buddhist Vihara and the Zurich Buddhist Vihara, and Ven. Halyale Wimalarathana Thera, the President of the International Buddhist Foundation in Geneva and the Chief Incumbent of the Geneva Buddhist Vihara, addressed the audience on the value of the Buddhist doctrine and the significance of the Tripitaka, while Ven. Dr. Thawalama Dhammika Thera, Chief Sanghanayake of Switzerland and Chief Incumbent of the Geneva International Buddhist Centre, moderated the discussion with the participants and speakers. Ven. Keembiela Kassapa thera, the Chief Incumbent of the Toronto Buddhist Vihara also participated in the event. The intellectual contributions made by the members of the Maha Sangha and the interactive dialogue that ensued with Ambassadors and diplomatic representatives of several countries sharing their views and perspectives enabled an incisive and insightful dhamma discourse, appreciated by all participants.